All materials were designed and reviewed in 2014 by scientists and educators at three HHS agencies with expertise in health and aging: the Administration for Community Living (ACL); the Centers for Disease Control and Prevention (CDC); and the National Institutes of Health (NIH). Some materials were updated and simplified in 2018. At NIH, in addition to NIA, several Institutes contributed to the Brain Health Resource, including NIAAA, NHLBI, NIMH, NIDDK, and NINDS. 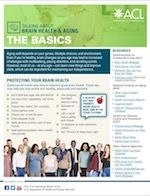 A two-page handout (PDF, 1.6M) called “Talking About Brain Health and Aging” covers the basics of brain health. The PowerPoint presentation (PPT, 581K) helps people learn about the impact some medicines can have on an older person's brain and the importance of talking with a doctor about this topic. The Educator Brochure (PDF, 838K) offers additional information for presenters to share with audiences. A one-page handout (PDF, 574K) for the audience covers some medicines' potential impact on brain health.